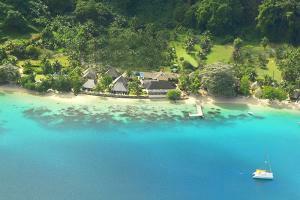 Located in the heart of Avea Bay, Hotel Le Mahana Huahine offers breathtaking scenery. The 22 Polynesian-style bungalows located in a tropical garden on the edge of a white sand beach provide tranquility and peace. A combination of French and Polynesian cuisines is offered at the bar and restaurant.